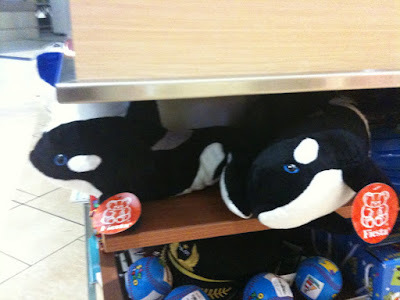 Ever since our trip to Sea World San Diego last June, our little dudes have been Shamu-crazy. It's probably encouraged/caused by me- I'm pretty big fan about Shamu myself. When I let the kids know I was headed out of town on a business trip recently they started crying saying they didn't want me to leave, until I told them I was going to San Diego and would bring them home some Sea World souvenirs. I'm sure they had a better selection beyond security in Terminal 1, but I was flying in and out of Terminal 2 so I was doubtful they'd let me past security with a boarding pass for another airline. What to do? I tweeted @Shamu and asked where I could buy Sea World souvenirs in San Diego without going to the park, and I got a response saying "Standby, I'll check." but didn't hear back with a solution. 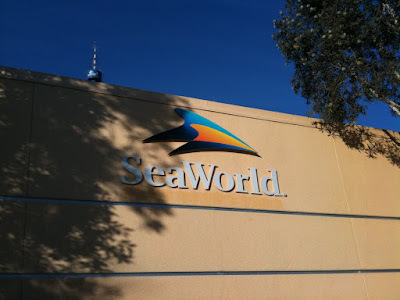 After my customer meetings on Friday, I was driving past Sea World so I thought to give a shot at checking if they had some souvenirs outside the park -or- better yet working my way into the park for just a quick shopping trip. It was about 3PM when I arrived at the gates where you pay for parking. Fortunately, nobody was there taking money- score! I grabbed a parking space and headed up to the park entrance gates. The booths where they sell tickets were also all closed (the park closed at 5PM the day I was there) but tickets were being sold at the Group Sales/Will Call window and there were other people in a short line. I decided to head over to the park exit to see if I could sneak in for just a bit. The gate agent advised that I could get a Shopping Pass at the Will Call window. 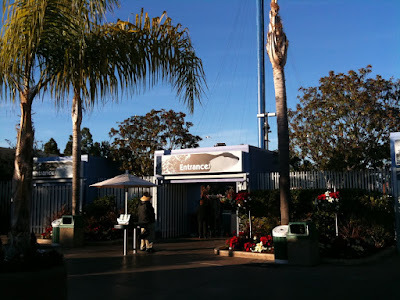 Once I got in the park I was like a kid in a candy store, snatching a Shamu Believe necklace for Will, a Shark-themed monster truck that Sam's been talking about since June, and a nice stuffed Shamu to boot. What seemed like expensive merchandise at the end of our last visit suddenly seemed like found money somehow. I exited the park, got my refund and headed back to the car a proud papa who would successfully return home with the goods. When I got home to Boston, the kids were asleep. The next morning when they woke up they were very excited to see what I got them. I was tempted to hold back the Shamu stuffed animal for a future occasion, but since I'd sent a picture of the airport knock-off Orca, 2-year-old Will was searching sadly through the bag after receiving only his little Shamu necklace. I folded and gave him his very own Shamu to match a similar one I'd bought for Sam earlier in the year. Although I do like bringing things home to the kids after a trip, I'm not a fan of buying junk at the airport. I'm still fuming about the $20 lead-infested cable car with 4 tiny pieces of Ghirardelli I picked up in San Francisco. Hopefully, next time someone does a Google search for "buy sea world san diego authentic souvenirs" they'll find this piece and it will help a traveler get some nice gifts for their kids. Please leave a comment if this helps- I hope it does.